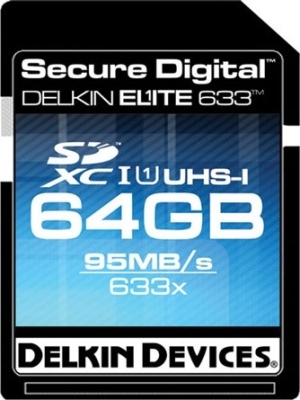 Delkin Devices has released what it calls the fastest SDXC UHS-I memory card in the world. The 64GB 633X rated card is meant for streaming HD and 3D video applications where speed and capacity are imperative: it promises read and write speeds of 95 MBps and 45MBps, respectively. Specialty photo and video retailers worldwide are now offering the card for a whopping $540.00. Following the 8GB, 16GB, and 32GB versions, it is the fourth capacity to be added to the company's recently introduced family of UHS-I memory cards. Delkin's newest Elite633 card is capable of recording up to 8 hours of high definition video or capturing more than 17,000 photos. All Delkin memory cards come with US-based technical support that offers free data recovery services and support for the lifetime of the product. Unfortunately, because SDXC memory cards utilize the exFAT file format, they are not compatible with older non-SDXC devices or operating systems. Advanced features like reliable Error Correction Code, Wear Leveling, and storage integrity in harsh conditions (like exposure to static, vibration, shock & UV light) remain. Elite633 SDHC and SDXC cards feature transfer speeds tripling previous Secure Digital Class 10 capabilities. Defined by the SD Association as enabling transfers up to 104MBps, this Ultra High Speed Bus-Interface is being integrated into applications like JPG & RAW burst-mode photography and real-time broadcast & streaming video. "As camcorders are moving towards flash memory storage and away from tape, we're simultaneously seeing a strong trend in videographers utilizing HD video capabilities in DSLRs," Anna Lopez, Delkin's Marketing Manager, said in a statement. "Standard SD memory cards are more than fast enough for typical applications but not nearly fast enough to keep up with the large amount of data that HD video requires, particularly when shooting a feature film or longer movie clip. Our new 64GB Elite633 card is able to record at speeds up to 45 megabytes per second and read at speeds up to 95 megabytes per second which eliminates any pause to the recording process that users experience with slower cards." SD cards are mainly meant for consumer-level products, but the $540 price tag begs to differ. On the other hand, most pro-level cameras still rely on Compact Flash (CF) for their primary storage needs, which is a much cheaper format. Given that the CF format is physically bigger than SD, this could eventually change as more cards are released and as devices continue to get smaller, but for now it appears that CF is the way to go when you're a pro.